Stockton, CA. - Matt Milburn dealt the Modesto Nuts a 2-0 shutout in the loss to the Stockton Ports on Thursday night at Banner Island Ballpark. Milburn (W, 8-5) retired the first 17 batters in his start for the Ports (71-58; 27-32). Beau Branton broke up the perfect game bid in the sixth with two outs. Branton lined a double to right-center field. He turned out to be the only baserunner of the game for the Nuts as Milburn retired the final ten to help the Ports (55-74; 25-34) avoid a sweep. Sanber Pimentel delivered the only runs of the ballgame with one swing against Nuts starter Darren McCaughan (L, 6-10). After a pair of singles in the third, Pimentel lifted a two-run double down the right-field line. That was all McCaughan allowed in the ballgame as he matched a career high with nine strikeouts. McCaughan worked 5 2/3 innings allowing just the two runs on six hits with only one walk. The Nuts' bullpen combined to work 2 2/3 scoreless innings and went a combined 11 1/3 innings without allowing a run in the series. The loss moves the Nuts two games back of a playoff spot. The Nuts head home to open a four-game set against the Giants on Friday night. 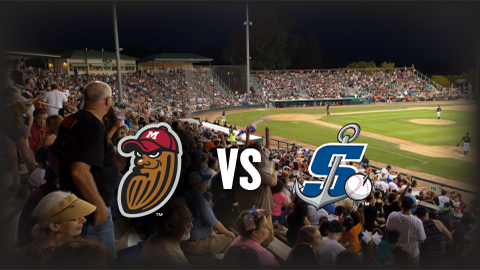 First pitch is at 7:05 p.m. Coverage on ModestoNuts.com will start at 6:50 p.m. Listen live online on your phone, tablet or PC by clicking HERE.